For the last hundred years the Yorkshire Dales has been missing a creature that was once a key indicator of the health of its ancient woodlands. The warm hazel thickets of Wensleydale, Wharfedale and the hazel coppices of Sedbergh and Dentdale used to be home to one of the most charismatic of small mammals – the dormouse. This elusive, tiny mammal was immortalised by Lewis Carroll in Alice in Wonderland and is known by its long bushy tail and sparkly black eyes. It could easily fit in a small teacup. By the end of the nineteenth century the management of traditional hazel coppices had come to an end. These were gradually lost to agriculture or to the planting of timber trees and the dormouse simply lost its home. Dormice spend most of their lives in shrubby trees and do not like to cross open ground so although their habitat is starting to return they can’t get to it without help. Fortunately with a little help from their friends at the National Park Authority, the People’s Trust for Endangered Species and Natural England the dormouse has made a comeback to the Yorkshire Dales. In June 2008, 35 dormice, bred at Paignton Zoo, were released into Freeholders’ Wood at Aysgarth Falls. After a brief period of being fed in their release pens to get used to the site, the dormice spread out into the surrounding woodlands to feed and breed in the Dales for the first time this century. The latest look in the nest boxes has revealed astounding success. Despite the very wet summer, 58 dormice, including well grown youngsters, were found in the 195 boxes at the end of last year and monitoring of numbers this year has proved even more encouraging. We are now working with neighbouring landowners to increase the amount of woodland and hedgerow available to our newest arrivals so that the dormice can spread throughout the area. Although it may be tempting to take a peek into the nesting boxes, our wildlife conservation staff are appealing to the public not to do so. Sadly, one of the new baby dormice was found crushed under the lid of a box last summer. We believe that someone has probably accidentally dropped the lid on its head when closing it. There are only two Authority staff who are licensed under the Wildlife and Countryside Act to open these boxes to monitor the dormice and this is done under rigorous scientific conditions to high animal welfare standards. We hope to hold events in the future to give people the chance to learn more about the Dales dormice and celebrate their comeback. Although there is little chance of seeing one of these elusive nightime creatures, September is the last month they’ll be awake before they slip away to hibernate through winter. So if you are out for an early autumn walk in the Dales, perhaps lucking for bats, why not keep your eyes open just incase you get very lucky! 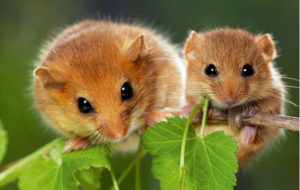 Dormice normally rear one or two litters a year, usually of four young, which stay with their mother for 6-8 weeks before becoming independent.